As Fall Leaves Illustration: Life may have sucked, but Vampirism Bites! Hello everybody! Sorry if I've been quiet, I've been doing a variety of work lately, hoping to share some of it here with you soon. I've also started getting prepped for the Detroit Fanfare comic book convention, where I'll be a guest. More info on that coming soon. Did some more band work recently, I'll hopefully be sharing that soon too. But right now I'd like to talk about Vampirism Bites! 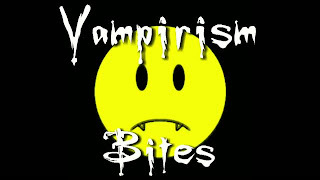 Vampirism Bites is a comedy vampire web series. It has some incredible characters and an incredible plot line with some surprises everyone will love. I was recently asked to join the cast for Season two as a century-old vampire named Dennis. You'll see my debut in Episode seven of Season Two. So what you should do in the meantime is catch up with the story! Go to www.vampirismbites.com to watch Season One! That way you'll be caught up and can watch the Season Two episodes as they come out weekly. For more on the story you can watch Season "Zero" as well, check out the website for more details!